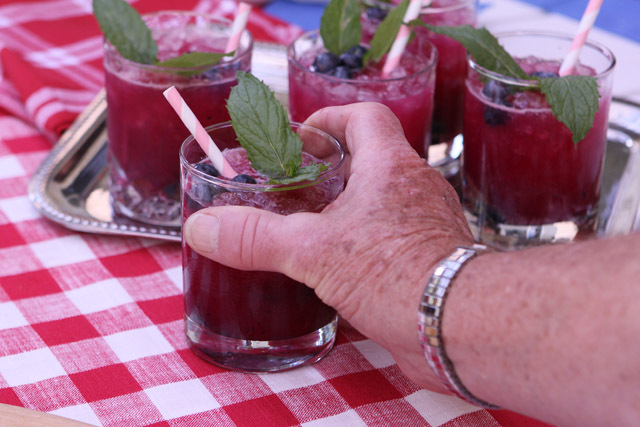 The Lightning Bug Cocktail is the perfect summer libation with Rum, frozen margarita mixer and blueberries. What? The folks at Bacardi want to create a drink just for me? Moi? Well heck yeah!! What would you have said? I answered a couple of quick questions and from that information they magically formulated something just for me to serve at a party featuring their BACARDI® Superior and BACARDI® Mixers Margarita Mix. Now you might think they would fashion a Margarita of sorts because even a cursory look at my Friday Cocktail series would make it clear I LOVE Margaritas but I was even more pleasantly surprised when they did not. Do I have some sort of implanted device in my brain like ‘Johnny Mnemonic‘ that allowed them to download information to further their creation? I must have…this was way too perfectly me! Maple Syrup? I could drink it straight out of the bottle (and yes I upped the portion just a tiny bit…like three times their suggestion; like I said I LOVE it!). Cayenne Pepper? There is nothing I love more than the combination of sweet and heat and this heat is so subtle even the people at my party who might decry spicy peppery anything thought it was great. I can’t deny I took some liberties with their invention and I hope they don’t mind. They sent party gifts for everyone and those gifts included a very cool muddler. As in smasher of all things in the bottom of cocktail glasses…so I added some blueberries and mint to the bottom and I smashed away. I also used the blender we received to mix everything up; I was serving a party of 10 and decided to make pitchers at a time instead of individual drinks; made my life so much easier. Then there was the name they conjured up. How on earth did they know how much I love lightning bugs? As a young girl I loved nothing more than catching and releasing them on summer nights. I always imagined they were my own personal Tinkerbell. Lightning bugs quite obviously do not covet living at altitude and I haven’t seen one in years so I was delighted to produce Lightning Bugs for my guests on this beautiful summer evening. We had a nice mix of folks here; combining family and neighborhood friends. Nate, Priscilla and Nate’s dad Nathan had spent the day dispersing rocks to replace pine bark mulch in a large landscaped area; they were ready for a break. A sure sign this cocktail was a winner? Nate wondered if there were more before he had even finished half of his glass. Why of course silly; I should have been a Boy Scout because I’m always prepared! Nate and Priscilla’s daughter Lena provided all of us with some comic relief, she was ‘adorable’ (her favorite word of the night). 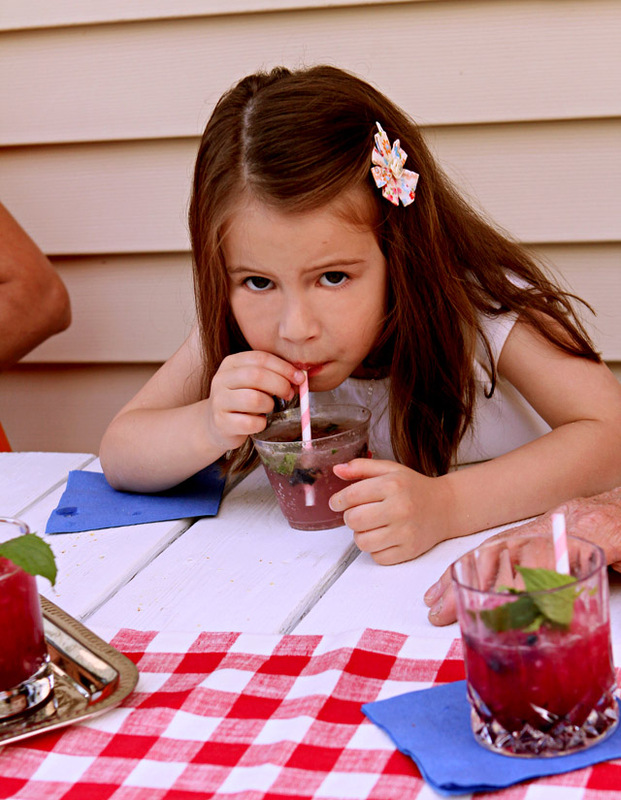 I even made her a kids version using the BACARDI® Mixers Margarita Mix; it’s clear it was a hit with her too! 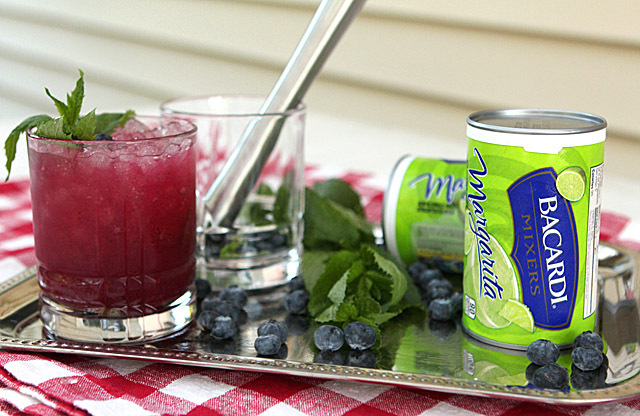 The mixers are alcohol free and made with real fruit juice so they’re versatile for both cocktails and mocktails. I love that I can keep them on hand in the freezer. True confession time? I make a killer margarita but it takes hours for the fresh squeezed juices and grated rind to meld to make that cocktail. When I don’t have that time? This Margarita mixer is what I use instead. Everyone needs ‘quick and dirty’ options and this is mine! I might spoil my friends dog Augi a bit but no, sweetie, there is no special doggy cocktail on the menu tonight. Still love me? What was on the menu? For starters a fresh salad. 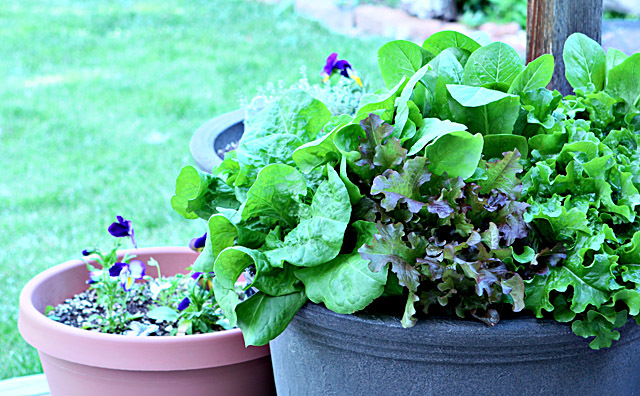 Fresh as in picked from this pot of mixed greens I planted on the patio. First time and not the last…we have loved being able to walk out on the patio and get our salad fixins’ each night. Now if only I had a photo of my dog Abbie absconding with some of that fresh lettuce. Really who knew? A dog loving lettuce? Certainly not me! As promised, we kept the cocktails coming; making those big batches was a VERY good idea. Plus, despite my proclivity to use all fresh ingredients, I really appreciated having the BACARDI® Mixers Margarita Mix in the freezer; creating cocktails for a crowd of ten almost demands some time saving prep and these were just that and I loved them. Did we eat? Of course we did! 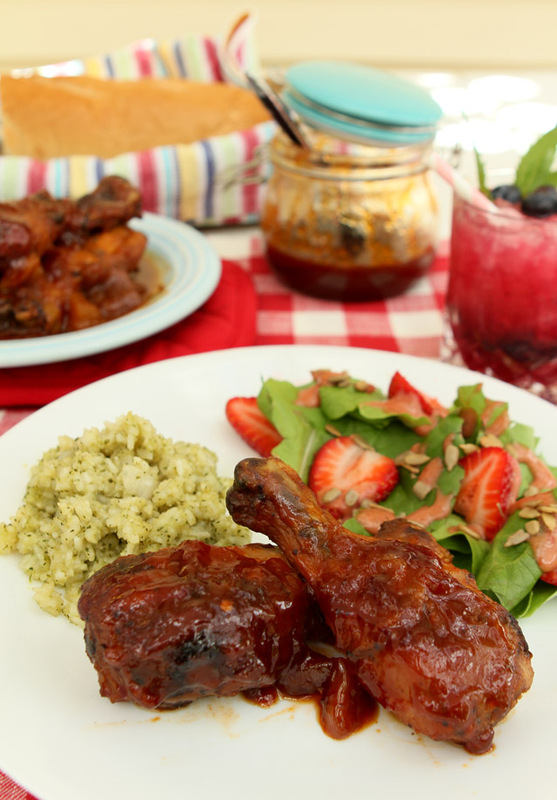 Fresh lettuce from the patio was used in a simple salad with strawberries, sunflower seeds and a homemade strawberry dressing; to die for Cilantro and Serrano Mexican Rice was served on the side and the main course of Smoked Chicken Thighs with a Chipotle and Bourbon Peach Barbecue Sauce was a huge hit; one guest insisted I bottle and sell the sauce, stat. He would be my first customer! Yes, there was dessert and they were scarfed down at ‘lightning’ speed! I made some of my favorite Chocolate Gelato with Bourbon and Chocolate Chips, a version of Cherry Garcia which had cherry ice cream, chocolate and white chocolate chips mixed in with chopped Bing cherries and the favorite, what I’m calling Mounds Bar Ice Cream. Coconut ice cream with coconut and chocolate chunks mixed in. 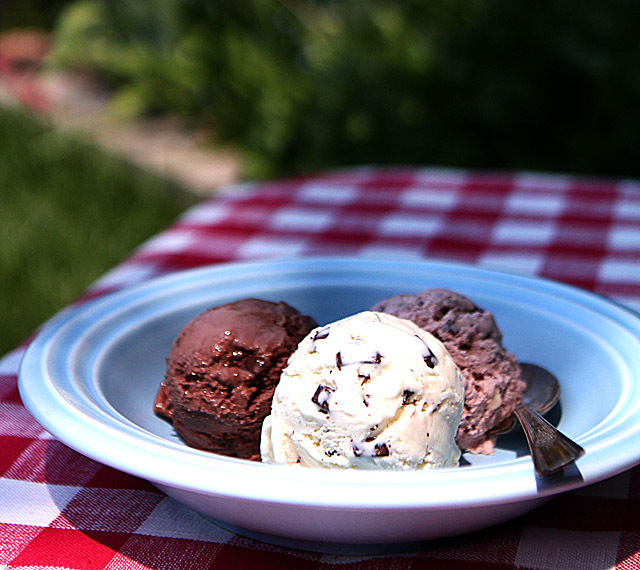 I’ll be doing posts in the coming weeks for the cherry and coconut ice creams…boy do I love summer foods!! Everything at this event was so well received I’ve already been asked if I would do it again for July 4th…sure, if you bring the mixers! 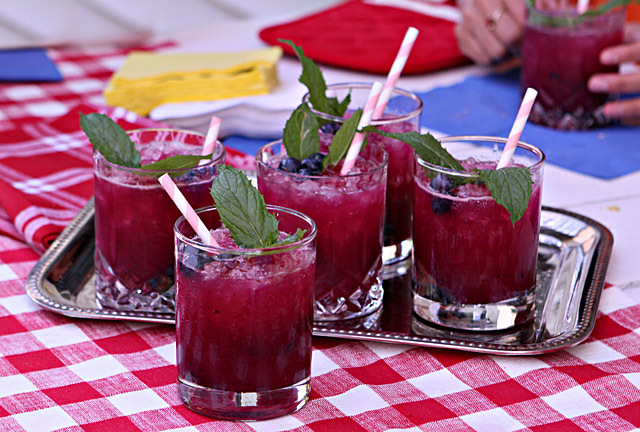 Put three mint leaves and 6 blueberries in the bottom of double old fashioned glasses and mash them with a muddler or the back of a spoon. Put the frozen BACARDI® Mixers Margarita Mix, the BACARDI® Superior, blueberries, maple syrup and cayenne in a blender or food processor and blend until thoroughly combine. Strain to remove any solids. 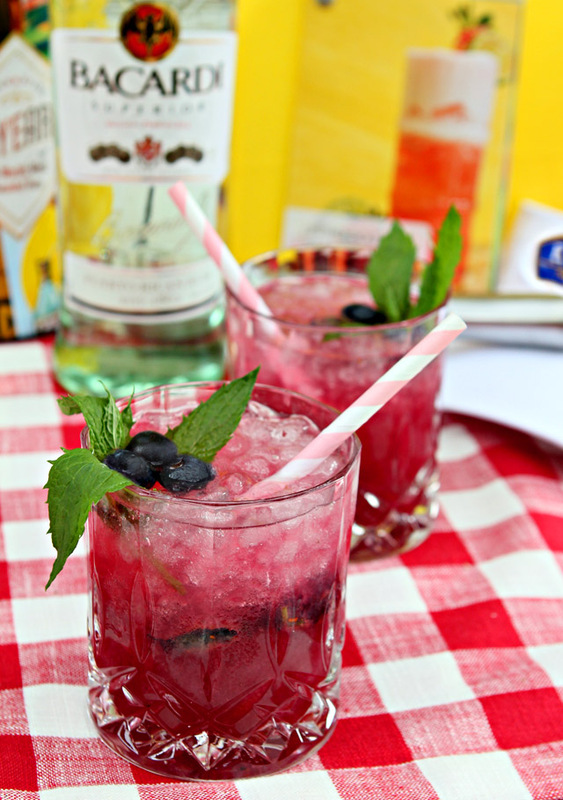 Fill glasses with crushed ice; add the rum and blueberry mixture and garnish with more mint and blueberries. BACARDI® Mixers is a premium line of non-alcoholic mixers available in 10oz cans in the frozen juice aisle. With seven easy-to-make flavors to choose from – including Strawberry Daiquiri, Margarita, and Piña Colada – there are endless ways to make your next party come together instantly! By providing cocktail recipes, party tips and food pairings year-round, we continue to give new reasons to blend every day. Find yours at www.facebook.com/bacardimixers. ENJOY RESPONSIBLY. ©2013 THE COCA-COLA COMPANY. ©2013 BACARDI AND THE BAT DEVICE ARE REGISTERED TRADEMARKS OF BACARDI & COMPANY LIMITED. BACARDI U.S.A., INC., CORAL GABLES, FL. NON-ALCOHOLIC MIXERS. Compensation was provided by BACARDI® Mixers via Glam Media. The opinions expressed herein are those of the author and are not indicative of the opinions or positions of BACARDI® Mixers. 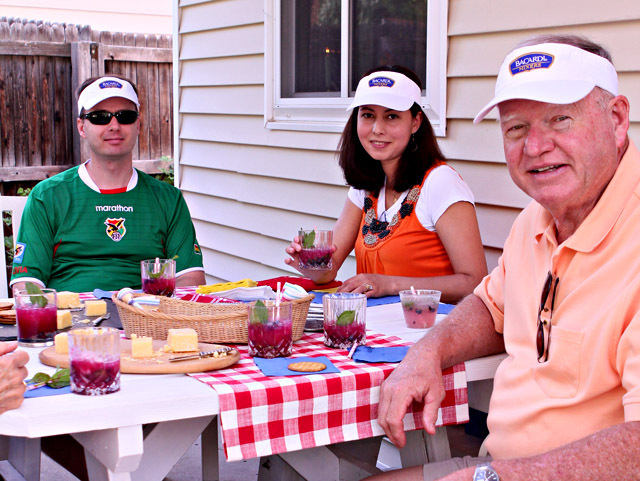 Thank you Susan…it was a very fun day with great food and friends; makes for the best photos! You are the hostess with the mostess for sure. What a lovely cocktail and what a lovely evening. The photographs are great and everyone certainly looked like they were enjoying the food, beverages and the company. Such a fun gathering! I love having a specialty drink for company and your Lightning Bugs sound terrific. Love that their concoction included maple syrup…so inventive. They really did hit it out of the park with this one Liz; not just the end result but the flavors they included. Yum this sounds good!! What a heavenly cocktail! Truth? Was worried it might not suit the guys. Bigger truth? They were the ones clamoring for more! So easy to make and so very good too. Oh WOW. This entire menu sounds amazing… love your photographs and the beautiful description of your day. The lightning bug cocktail sounds absolutely delicious. I haven’t seen the Bacardi Mixers on sale here in Australia yet but I’ll be looking out for them! Thanks for this beautiful post. Love your blog! Thank you SO much…sometimes a comment comes along that just makes my day. You did that for me this day; helps to make the effort all that more worthwhile. Certainly Debie…you are most welcome! I will be sure to get some of these Bacardi mixers, thanks for letting me know they are out there and ready for summer! I like the idea of drinks in a pitcher– feels less fussy than making each one separately and serving it, plus it is nice to have an easy refill ready to go. Hope to see you soon! There are several types but this was a true find Holly; as much as I love the process of making something up; I also love the ease of them for just plain making something! We should do coffee…iced even! Well now, this sounds delicious! If it wasn’t minus two here today, I might just make me one! Brrrr…really? Well, rum might warm you up a bit that’s true! Aw…thanks Stacy and back at ya! Can’t wait to see your recipe; that old fashioned dessert was so good now I want to rejuvenate a few more! Those drinks look amazing and so does the ice cream. I am with you, love summer drinks and foods. 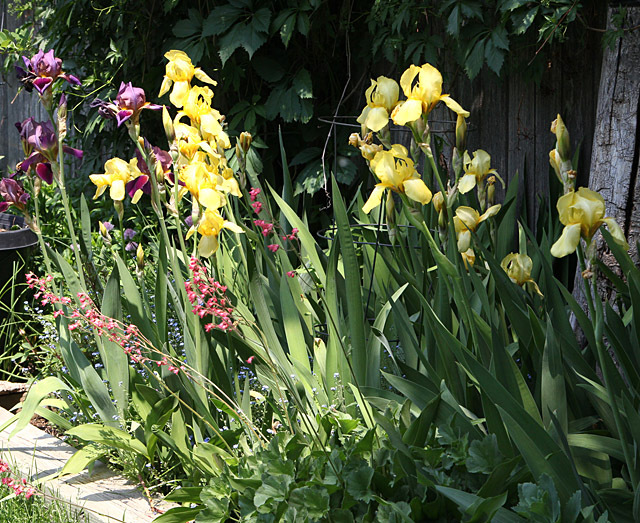 What a fun summer party in such a gorgeous garden party! I am so glad we met! What a fabulous party Barb! I am definitely going to have to pick up some of those Bicardi mixers – will be handy to have – as you said, doing all that juicing takes some time and when you add that to all the other food prep for a party… sometimes it’s just one thing too many! Those ice creams sound sooooo good… can’t wait for the recipes!!! Oh my what a lovely drink! Looks like you had a wonderful party with great food and drink. Even the dogs loved it! By the way, where’s my beautiful Abbie girl? I hope she got some chicken to go with her lettuce. 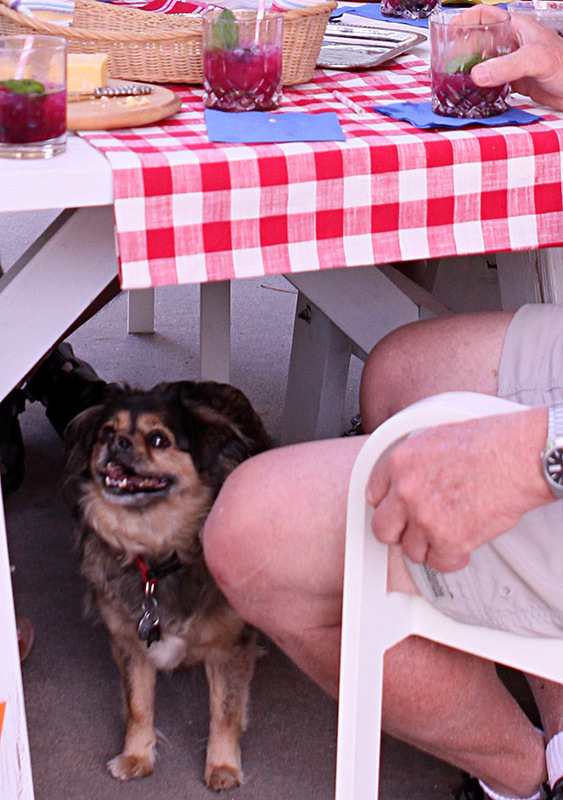 She was sniffing around everyone in the background hoping for a morsel to fall; that’s my Abbie! Sounds like a fun time! And that’s not a bad sounding drink – I’m with you on maple syrup and cayenne. I had no idea Bacardi made mixers – just wish they’d amp up the flavor of their Puerto Rican rum so it would approach the goodness of the Cuban rum they used to produce (and still may, although of course if they do we can’t buy it in the US). I’ll have to check out those mixers. Anyway, really fun read. And delish cocktail – thanks. It was good…a bit tart, a bit sweet; definitely fruityish. Sometimes I’m not so sure about guys liking cocktails like this but they downed them…so I say SCORE! !